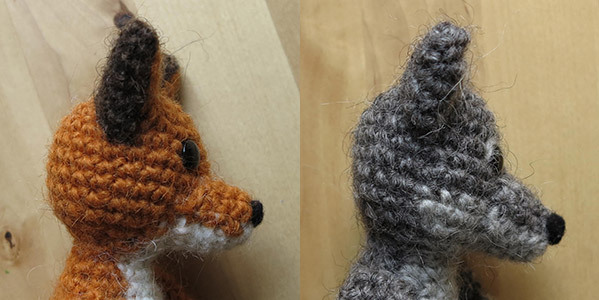 When making crochet animals, the attaching of body parts is something that goes with it. But how do you do it the neatest and best possible way? For example, when I started making these animals, sometimes my sewed on muzzle looked very different from when it was pinned on, and certainly not better. When designing my latest animals, I paid close attention to how I attach the muzzles and heads. How do I do it and how can I explain it to you? I have come up with two photo tutorials. How to attach a muzzle. You can see the direction of the needle for all four steps of both tutorials in the pictures. 1. Of course the muzzle or beak is pinned to the head before you start. When you start sewing, make sure the thread is at the outside of the muzzle, like you see in the first image. 2. To make your first stitch, sew through both loops of the next stitch of the muzzle and pull the thread. 3. Now find ‘the right stitch’ in the head and sew through that stitch and pull the thread. Usually that stitch is below the pinned on muzzle. Sometimes you have to try a few stitches to get the desired result. 4. Now sew through both loops of the same stitch of the muzzle you just came from, as illustrated in the last picture. If you repeat step 2 till 4 for the complete muzzle or beak, you have it sewed on exactly as it looks when pinned on. Because you have sewed behind the crochet loops, the stitches you’ve just made are barely visible. Now you can decide if and which stitches need to be tighter, so the muzzle blends in better. You can stitch them the way you like to. Attaching the head to the body, both open pieces with the same stitch count. The most challenging thing about sewing these parts together, is preventing the neck from becoming too narrow. You also want the pieces to blend together nicely. 1. I usually sew with the tail of the head. Make sure it is on the outside of the head when you start. 2. Now sew through both loops of the body, from the outside to the inside and pull the yarn, but not too tight. 3. Sew now through only the outside loop of the stitch of the head, which is just above the stitch of the body you just sewed through, like you see in the second picture. Again, pull the yarn, but not too tight. 4. Now sew through both loops of the second stitch of the body and repeat the steps. By pulling the yarn not too tight, the stitches become less visible and the neck won’ become too narrow. It does have to feel steady, so experiment a bit how tight works best for your doll. I hope this tutorial is a good tool so everyone who makes my patterns can attach their animals perfectly. If you think something is missing, please let me know. In this post I’ll give some tips about how to get the nicest and neatest eyepatches. Eyepatches can give your animal that bit of extra expression, but if they aren’t the right size and shape, they can ruin the face of the animal and make them look very silly. The most important thing is the size. Especially too big a patch can give an idiotic result, like your doll is looking in the head lights of a car…aaaaargh, don’t want that. Always match the size of the eyepatch with the eye size. Usually it’s nicer if there is more eyepatch above the eye than below it. So make sure the eye is inserted at the bottom of the patch. If you use a brads as eyes, it’s easy, you can stick it where ever you like. But if you use animal safety eyes that can be a bit tricky because they have wide necks, but there is a way. Just crochet a magic ring or starting chain, insert the eye in it and crochet a few stitches till you get the right size and shape. You don’t have to go all around this way and can adjust the size to the eyes. When attaching eyes with eyepatches, crochet ones or sewed lines, sew them tight to the head and not sticking out too much and always before you close/attach the eye caps. Otherwise you won’t be able to sew them. A useful extra tool for making the patches even look better, is a needle felt needle. 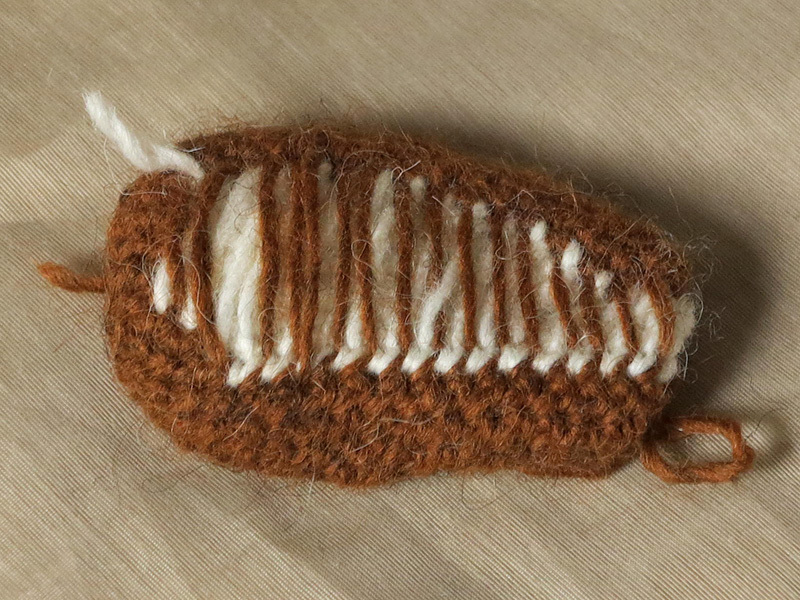 Especially if you use wool, needle felting the patches a tiny bit can make them look more neat. Patches aren’t necessarily. If I’ve used them for a doll, you don’t have to use them too. If you like your animal better without them just leave the patches. It’s your doll! Here are some examples of eyepatches that give the right result. What else can I think of….just take your time and do it with care. Walk away when you’re not yet satisfied or let your doll look in the mirror, so your brain gets a fresh view of the result. With this in mind, your patches should become perfect! 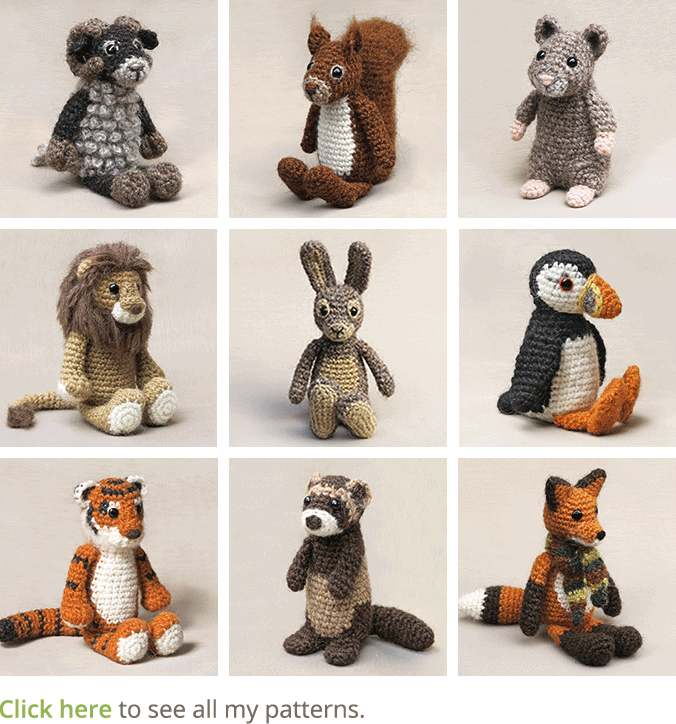 Most of my crochet animals are made in multiple colours. So, changing colour is something you’ll need to do often when making one of my patterns. 1. 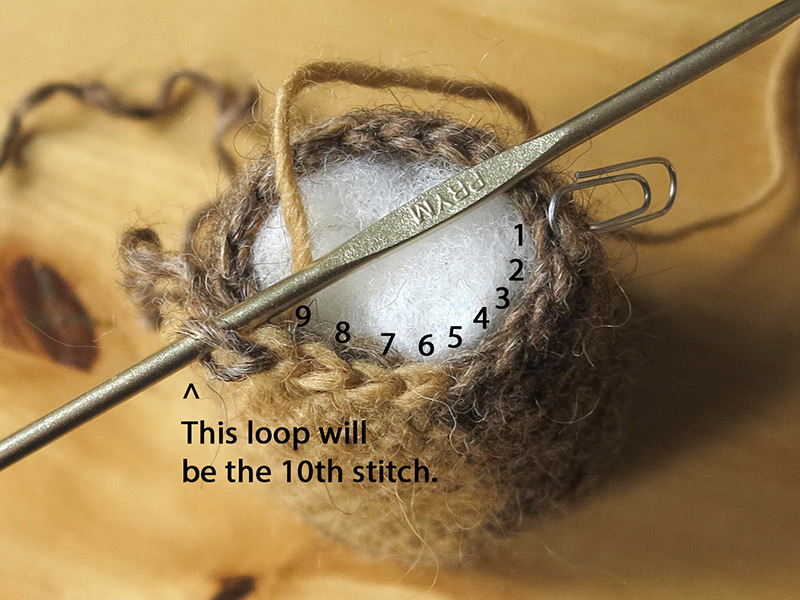 Always change colour in the last loop of a stitch, so the loop on the hook you end with, is the new colour. Not the stitch in which you changed colour will have the new colour but the next one. In terms of crochet, if it says ‘change colour in the 5th stitch’, the 6th stitch is in the new colour. This way you get the neatest result. This image is an example of how the round ‘sc in the next 6, s2tog, sc in the next 12 = 19 (change colour to B in 5th, to MB in 9th)’ looks like in stitches. 2. I never cut the yarn between the colour changes but leave it where I change. When I’m back to using that colour, I take the thread and make sure it is at least as long as the row of stitches in the new colour, so there won’t be any tension on the thread in the inside of the piece, but it is gently placed to the side. Make sure the thread is not too short, your piece has to stay flexible enough, you don’t want it pulling together. This all means that sometimes there are several skeins of yarn attached to your project. If you don’t like that, you can cut the yarn every time you change colour, but I just don’t have the patience for it and also prefer the result you get when you don’t cut the yarn. I added an image to illustrate how it looks. This post is a renewed version of an older post of mine. Because I developed new skills and discovered more techniques, I found the old expression post to be a bit outdated. 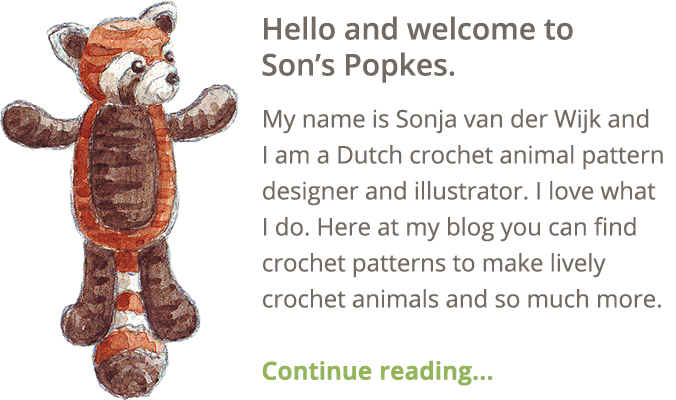 In this post I’ll explain how I design a crochet animal face. One of the most challenging elements in making crochet dolls is giving them the right expression. That’s what finishes the doll and can make it either beautiful and striking or kind of ridiculous looking. Making the face is complicated and comes very closely, even though it seems quite simple, just a few stitches right? It usually takes me a while and I have to ‘take it out’ a few times before my doll has the right expression. Here are a few samples of faces I’ve made so far. Below the images I’ll explain how I get the right expression. 1. A patch behind the eyes makes him look more like a wild bunny. The starting chain forms his mouth. 2. A playful cat needs wide eyes, so a felt patch behind the eyes. He also has a perplexed little mouth, like real cats. 3. Wolfs have a brighter spot above their eyes. For this crochet wolf I decided to add a small thread to create that wolf expression. 4. Starfox really has a sturdy expression, he also has green eyes. So I made a felt patch, black lashes and big white eyebrows. 5. This is a very happy brown eyed bunny. Just the eyes looked a bit dull I decided. So he has felt patches behind his eyes and a cheerful embroidered mouth. 6. I wanted to give this crochet bear a funny looking face. To get that expression I made his mouth unsymmetrical. To give my Popke the right expression, I play a little with the embroidery thread. A symmetric mouth for example gives a neat look, but maybe not the right one. The distance between the eyes is also very important. A description of how to set them, I don’t think will help much, you just have to experiment on each and every doll you make. There are some rules, like far apart is cute and close together not very smart looking, but I tend to ignore those rules and just see what looks best for a particular doll. The tip in this topic is therefore, don’t underestimate the importance of the expression. Take your time and experiment. If you’re not satisfied after trying many times, just stop and try again the next day or so, when you’re fresh again. That usually does the trick for me. And another small tip, it’s very important to see for yourself and experiment on your version of a Popke. Maybe you don’t like the felt patch for your lop rabbit or the white eyebrow on your wolf. Just rock out and do what you like. In this post I will tell all about the yarn that gives my animals their characteristic looks and that is a big part of my recognizable style. Léttlopi wool. This yarn is my all time favorite. It is very rough and rustic and fuzzy by itself. When I started making crochet animals I first used other kinds of yarn, mostly mixed kinds of wool, alpaca, merino and polyamide. Some gave a good result, others looked awful. Texture is very important to me. I’m also an illustrator and my specialty is painting with acrylic paint (it used to be oil based paint but I found acrylic to be more modern and suitable for the work I make). In my paintings you can clearly see the brush strokes and the colours don’t always blend perfectly. The paint is very visible. For my crochet animals, I like to have that same rustic and living style. That is why Lopi yarn is so suitable for my designs. It has a wild look to it and you can see the sheep hair. It comes in many beautiful powerful colours. It is 100% wool, so it is 100% living! The yarn is very suitable to crochet with and I love working with it. I always use a hook E/3,5 mm. The Léttlopi is for 50 grams ca 100 m/109 yd. The yarn has a good grip on my hook and is very flexible. In my opinion it’s more pleasant to work with than cotton or acrylic. What is very handy about working with this yarn, is that it has a fuzzy look, but still is suitable for making a magic ring. Also, when you have an unchancy part, you can take it apart without too much effort. Especially when designing that is very convenient and saves a lot of yarn. Because of the fuzzy texture, gabs are less visible if you by accident crocheted too loose at some parts and the decrease and increase stitches become pretty much invisible. Another big advantage of this yarn is, the colour changes look very neat because of the texture of the wool. There are some things that are good to know when you’re working with this wool. Because this yarn is 100% wool, I’ve noticed the thickness of the thread can vary a bit. I don’t mind it at all, because it doesn’t have a major effect on the outcome of your animal. Keep in mind that when assembling a doll and the thread has gone through some stress already, don’t pull it to hard, it’ll loose it’s strength. 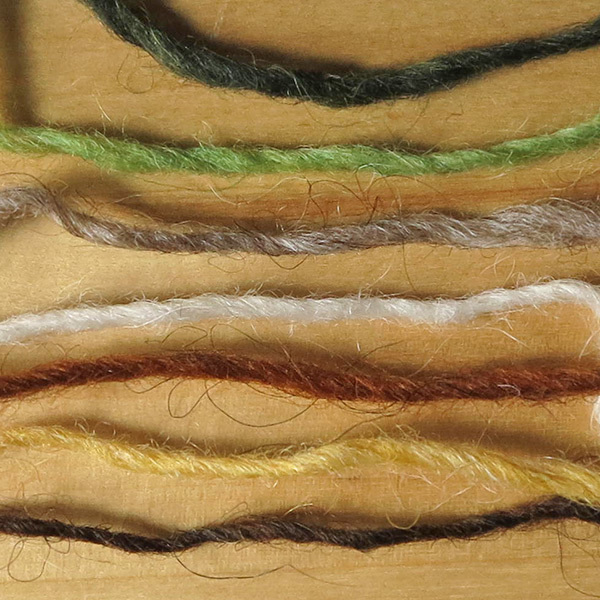 I added a few images above to show the beautiful texture of the yarn and the result. Below you can see the texure of the colours. You can see the sheep hair very clearly in some colours, which gives my dolls their rustic look. To sum it all together, this yarn is perfect to crochet with if you like a rustic and fuzzy look. It gives a doll a beautiful rough texture but is neat at the same time. There are a few little things you have to keep in mind when working with this yarn but they haven’t got any effect on the outcome of your animal. The result will be beautiful. Here’s a link to Lopi’s website. In this post I’m going to explain the importance of stuffing and shaping amigurumi. Because if you do this carefully, it can make a lot of difference to the end result. Let’s start with stuffing. When I stuff a crochet animal head, I start by putting in a piece of fiberfill, from which I know it’ll cover the inside of the head, but isn’t yet enough to fill the complete head. When the fiberfill is inside, I push it outwards, so all sides now are covered with a layer of fiberfill. That leaves a hole in the filling. Carefully I add more fiberfill in the remaining hole, still pushing it a little outwards till the entire head it stuffed. If you want a piece to stay in a certain shape, stuff it tighter. And also keep in mind the stuffing will ‘shrink’ a bit after some time so always use enough. I stuff heads a bit more firm than bodies. While stuffing, I also shape. To illustrate this, I’ve used the fox and wolf heads as an example. Their basic shape is the same, only the wolf has bigger cheeks. The stitches are different at the chin of the wolf, but that doesn’t matter for what I’m trying to explain. What I mean is, you can make a round shape round like a ball, but that same shape, you can also make flatter. The wolf needed to have a wider, less rounder shape. So, while stuffing, I made sure the cheeks stood out and I also made the head flatter by pushing the stuffing more to the sides and pinching the head a bit flatter, so it wouldn’t be round. You can see that in the image. I keep everything a bit soft but firm, it should never feel hard. The wolf I stuffed firmer than the fox, because I shaped the head. This is the way I do it and it seemed useful to explain here. Finding the right nose for crochet dolls and amigurumi sometimes can be a bit of a challenge. Needle felting is a great way to make the perfect nose. You probably know the shape and size for the right nose, but getting it isn’t easy. For some projects an embroidered nose ‘ll do great. But some crochet dolls need a more specific nose, like a little ball for a bear or mouse, or a flat triangle shaped soft nose for a cat. I’ve tried many things like flat felt noses to sew on, embroider with a thick yarn till it was round enough, or putting yarn around a safety eye to get the right nose. That all didn’t work out too well. 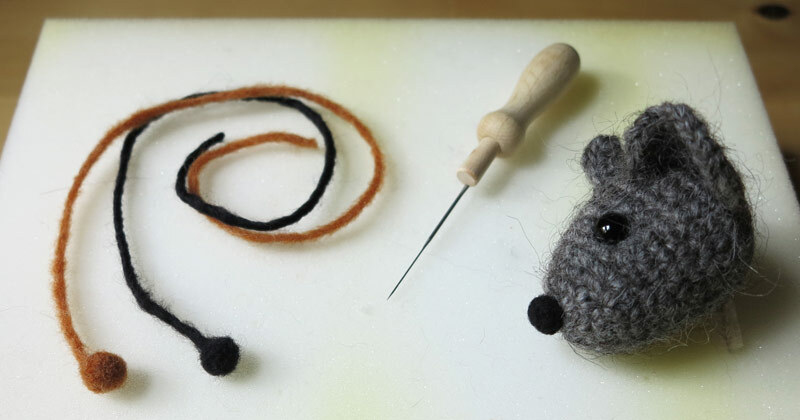 A good and quite easy way to make a perfect and soft nose, is to needle felt it. All you need is a thin needle felt needle and a piece of foam. 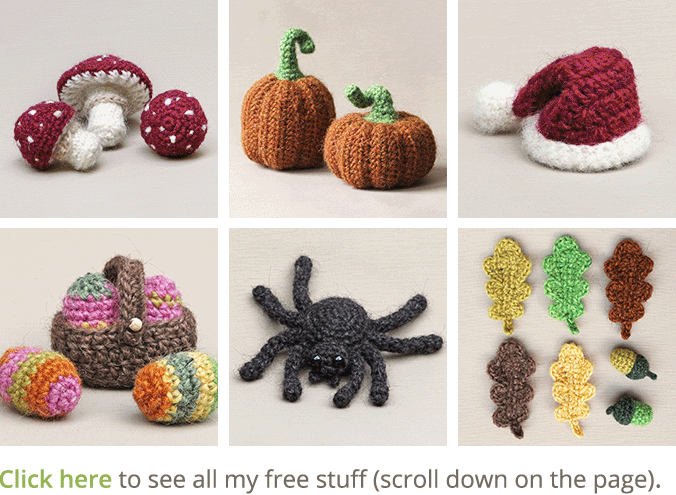 To felt with, you can use the wool you crochet with. Just grab a thread and fluff the part of it you think you’ll need to get the right size nose. Don’t forget to leave a long tail for sewing. Roll it into a loose ball and start pricking it, till it is the desired shape and firm enough. It really works well, you can even needle felt it tighter or more in shape after you sewed it on your doll his head. Here’s an example with what you need, two loosely felted nooses and the firm felted nose I made for my Forest Mouse.